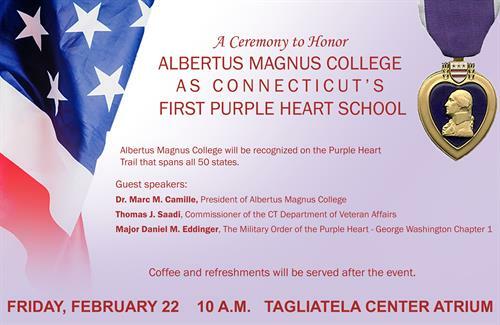 During this ceremony, Albertus Magnus College will be recognized on the Purple Heart Trail that spans all 50 states. Our guest speakers will be Dr. Marc M. Camille, President of Albertus Magnus College, Thomas J. Saadi, Commissioner of the CT Department of Veteran Affairs, and Major Daniel M. Eddinger, The Military Order of the Purple Heart, George Washington Chapter 1. Coffee and refreshments will be served after this event. February 22 at 10:00 a.m. to 12:00 p.m.